Sonicity Fitzroy (a.k.a. Soni) Celebrates her 5th Anniversary of SL Radio this Spring, featuring SL musicians! 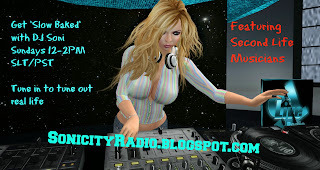 Bringing her real life radio experience into Second Life, as well as her love and appreciation of the talented musicians here, she found the best way to pay tribute to the in-world music scene was to dedicate her radio show to exclusively SL singers and bands. 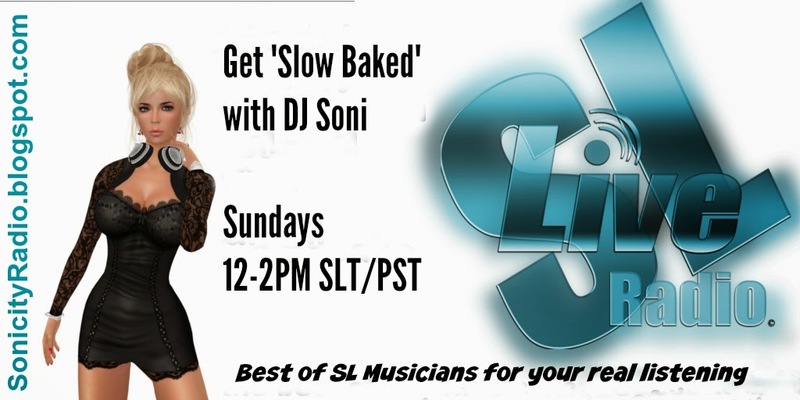 Her show is called Slow Bake, and ranges in genres, but much of SL's music is acoustically driven, offering a slower pace. She particularly focuses on original works. Her show is part of SL Live Radio's growing network of radio stations, and is featured on Sundays 12-2pm SLT at the Station's Studio 2 in Misty Falls. As a feature journalist, Soni's blog (Sonicity Radio) keeps up with SL Music events and offers an occasional profile of the talented artists featured on her show, as well as live music shows. Her list includes Kyle Bronsdon, Skye Galaxy, Red Heaven, Beth Odets, Ganjo Mokeev, The Matthew Show, The Follow, Grace McDunnough, David Csiszer, James Olmos (AcousticEnergy), Harry Frychester, Kevin M. Thomas, SaraMarie Philly, Nance Brody, Strum Diesel, Gina Stella, AMForte Clarity, Dan Russo, Pilgrim (Pete Mroz), Don Galaga, Josie Anderton, Christopher Quan, Suzen Juel, Lindi Moo, Seth Regan (Mankind), LizAday, Phemie Alcott, TerryLynn Melody, Tone Uriza, Tristyn Homewood, Twin Ghost, Strummer Vultee, and Blair Bond...and some classic finds of Mimi Carpenter, Gina Gracemount, Max Kleene, and Clairede Dirval - and so forth. She is open to new artists to include on her show. She appreciates the support of SL Live Radio founders/owners Esme Capelo and Thorn Andel.